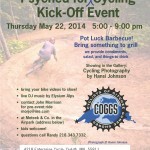 Thursday May 22, 2014 at Meteek & Co, 5 – 9 pm. We’ll have the barbecue going, and provide condiments, salad and drinks–bring something to grill, bring your biking stories (and videos! we’ll load them up and project them in the shop) and your enthusiasm! Hansi Johnson will be showing his awesome photographs – his first photo show, if you can believe it. He will be selling prints and donating some of the proceeds to COGGS! And Elysium Alps will be rocking some tunes for us.